OPEN HOUSE every Thursday 1130 am to 1:00 pm and Saturdays 12:00 pm to 1:30 pm. 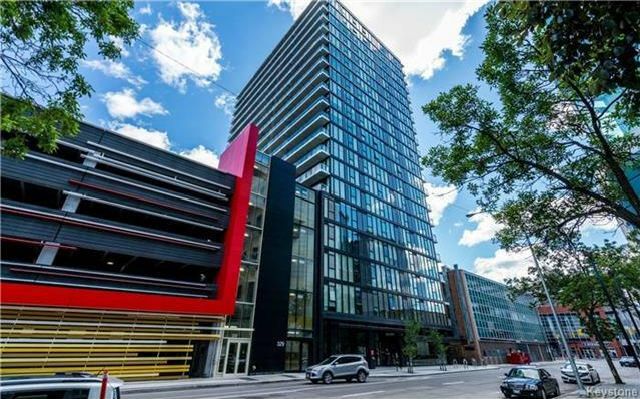 BLOW OUT PRICE for this brand new never lived in state of the art downtown condo overlooking Bell-MTS Centre! BE QUICK! Seller authorizes it to sell approximately $50,000 below cost!! Highly desirable south east corner unit, 2 bedroom executive/chic condo at Glasshouse Skylofts offers stunning style, sophistication and cutting-edge design to the heart of the city's downtown. Features high upgrades including engineered hardwoods and tile through out, an in suite laundry and gourmet kitchen with island, upgraded stainless steel appliances, deluxe bathroom, and a wall of custom blinds. Garden doors to your own private balcony or else enjoy the ROOF TOP PATIO AND LOUNGE giving you an exceptional view of the city skyline. Work out in the gym or relax in the theatre which boast a large screen and projector. HURRY! Includes one covered parking spot valued at $35000! CHECK OUT THE VIDEO FOR A TOUR!